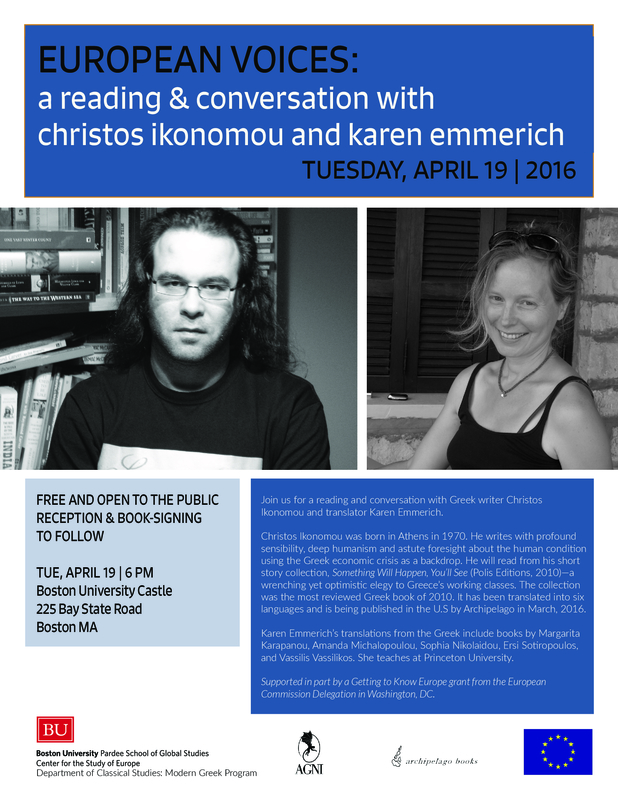 Join us for a reading and conversation with Greek writer Christos Ikonomou and translator Karen Emmerich. Ikonomou will read from and discuss his short story collection, Something Will Happen, You’ll See (Polis Editions, 2010)—a wrenching yet optimistic elegy to Greece’s working classes. The collection was the most reviewed Greek book of 2010 and the recipient of the prestigious Best Short-Story Collection State Award. It has been translated into six languages and is being published in the U.S by Archipelago in March, 2016. Christos Ikonomou was born in Athens in 1970. He has published two earlier collections of short stories, The Woman on the Rails (2003) and Something Will Happen, You’ll See (2010). Described by Italy’s La Repubblica as “the Greek Faulkner,” Ikonomou writes with profound sensibility, deep humanism and astute foresight about the human condition using the Greek economic crisis as a backdrop. Karen Emmerich’s translations from the Greek include books by Margarita Karapanou, Amanda Michalopoulou, Sophia Nikolaidou, Ersi Sotiropoulos, and Vassilis Vassilikos. Her translation of Miltos Sachtouris for Archipelago was nominated for a National Book Critics Circle Award in Poetry and her translation of Yannis Ritsos’s Diaries of Exile with Edmund Keeley won the 2014 PEN Literary Award. She teaches at Princeton University. Free and open to the public. Reception and book-signing to follow.